Despite the giggles that greeted Donald Trump at the UN this week, the threats and insults he hurled at Iran are no laughing matter. The US president is pursuing a deliberate, premeditated and high-risk campaign to provoke, intimidate and ultimately overthrow the Tehran regime. His verbal assaults are matched by damaging US sanctions that hurt ordinary Iranians and will culminate in November with a global embargo on Irans crucial oil exports. At that point, Irans hardliners, more or less restrained until now by President Hassan Rouhani, may take matters into their own hands. The dire prospect of direct armed confrontation in the Gulf is increasing by the day. Ever since he repudiated the multilateral deal limiting Irans nuclear activities, which was backed by the UK, the EU, China and Russia in 2015, Trump has been gunning for Iran, while at the same time trying to justify his destructive behaviour. He claimed Iran was in breach of its obligations a claim roundly rebuffed by the IAEA nuclear watchdog. He declared, without evidence, that his pressure tactics were changing regime behaviour in Syria, Yemen and Lebanon. Now, frustrated by Irans entirely predictable refusal to sue for peace, he is upping the ante, accusing its leaders on Tuesday of sowing chaos, death and disruption. Trump denies, in public, that he is plotting regime change. But others, such as John Bolton, his national security adviser and Iraq war hawk, are more candid. Americas declared policy should be ending Irans 1979 Islamic revolution before its 40th anniversary, Bolton wrote in January. Speaking to Fox News, he said: Our goal should be regime change in Iran. Bolton weighed in again after Trump spoke in New York. Let my message today [to Iran] be clear: we are watching, and we will come after you. If you cross us … there will indeed be hell to pay. Trump, a novice in international affairs, has undoubtedly bought into the simplistic anti-Iran narrative peddled by Benjamin Netanyahu, Israels hawkish prime minister, and some US-based supporters of Israel. Netanyahu routinely portrays Iran as an existential threat to his country, and has advocated military action in the past. Trumps new comrades-in-arms in the Saudi royal family and other Sunni Muslim Gulf monarchies have also won his unthinking support for their age-old, region-wide struggle for influence with Shia Tehran. But there are other factors in play. Like Netanyahu, Trump may see political advantages in playing up the Iranian menace. His UN speech, bragging of his achievements, was aimed more at a domestic than an international audience. Trump certainly had Novembers congressional midterm elections in mind, since victory for the Democrats potentially threatens his presidency. The springing of an October surprise is an old tradition in US electoral politics. If things are going badly, Trump is not above manufacturing an international crisis next month to rally the country behind his shabby banner. Iran is being set up as target of choice. Trumps boundless ego is another negative element influencing events. Naively, he seems to believe Rouhani or even Ayatollah Ali Khamenei, Irans supreme leader, can be brought to the negotiating table under duress and then convinced to mend their ways by his unsurpassed personal charm, as with North Koreas Kim Jong-un. Yet there is no real parallel with Kim who, working from an infinitely weaker position, deftly exploited Trumps vanity in Singapore last summer. Such thinking betrays, in any case, a fatal ignorance of Iranian history, character and political culture. Nor will self-interested American exhortations to the Iranian people to rise up against the regime succeed. There is plenty of evidence of corruption and economic discontent across the country. Irans eccentric political system is deeply flawed. Its actions in Syria and Yemen are aggressive and wrong. Iranians undoubtedly deserve a more accountable, less repressive government. But they will not mount a second revolution at Washingtons bidding, simply to satisfy Trumps insincere, half-baked ideas about freedom and democracy. The dangers inherent in Trumps crude pressure tactics were dramatically illustrated following last weekends terrorist attack on the Revolutionary Guards Corps (IRGC) in Ahvaz, in south-west Iran. There is a long history of separatist agitation among Khuzestans Sunni Arab minority. A local group claimed responsibility for the attack. But thanks to current tensions, the incident quickly blew up into an international incident, with Iran, the US, the Saudis and others across the region swapping accusations of blame. If Rouhani had not been on his way to New York, the Revolutionary Guards might have already launched a revenge attack. They are still threatening to do so. So imagine the danger if, when the US embargoes Iranian oil, the IRGC attempts to block the Strait of Hormuz in retaliation, as it has threatened to do, or Irans allies in Yemen fire missiles at Saudi tankers in the Red Sea, as has happened recently. The US naval base in Bahrain could also be a target. 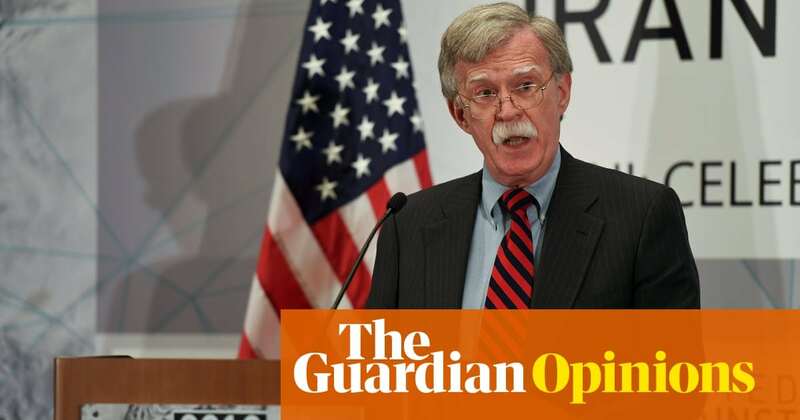 What will the armchair warriors Trump and Bolton do then? Given their reckless posturing to date, they would have little alternative but to respond with force. There is, after all, no direct diplomatic route, no way of talking reasonably. Their idiotic behaviour has seen to that. On the Iran question, the US has alienated European friends and Russian and Chinese rivals alike, spurning their advice and threatening their trade. Trump is busy burning bridges, not building them. Unless something changes soon, by accident or by design, he will have his war.